Take a look at our various Commercial Case Studies. We've completed so many projects that it's highly likely we've successfully completed a project similar to the one which you may be considering. Don't hesitate to contact us for more details on any of our commercial activities. If you are on a diet, then it’s not recommended to visit Haydens Bakery, as you will see some of the most exquisite looking sweet delights you can imagine. 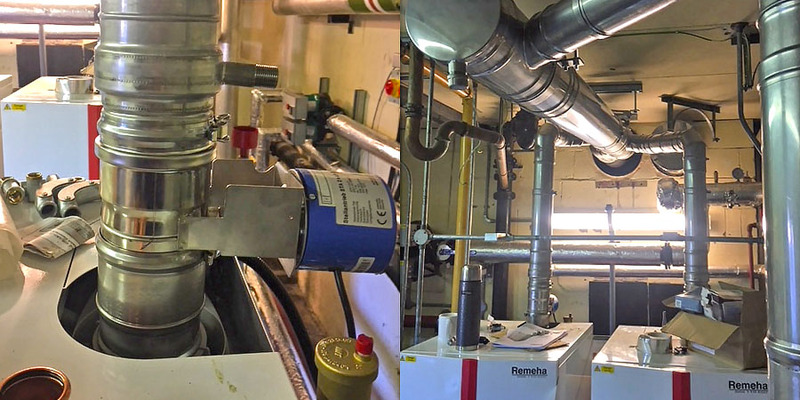 So, our Schiedel Commercial team, who aren’t too concerned about their figures, were pleased to be working with BSS Southamption to install 4 ICS flue systems to replace the existing flues, for the family bakery, established in the 1976, but now supplying some of the UK’s most respected food retailers and coffee shops. The installation was in two stages, with Stage 1 to install two systems and Stage 2 to install the remaining two systems. The flues specified were ICS, which is a twin wall flue manufactured with a stainless steel liner and stainless steel case. It is insulated with a 25mm thick high-density (128kg/m³) superwool blanket. For more information, don’t hesitate to contact us today for any help and advice if you have a similar project. Schiedel were involved with the New Skolkovo site in Russia, which is one of the biggest Data Centres in Europe. It was constructed for the main bank of Russia, Sberbank. This project was designed by Zaha Hadid. Many thanks to our colleagues in Schiedel Russia, who provided this article. Main task of Sberbank Data Centre is to increase the reliability of Sberbank’s IT systems and ensure the growth of its IT infrastructure. At the same time, reliable power supply of such an object is the main condition for its high operational stability. Data Centre consists of five standard modules, is 2000 server racks with each power station capacity of 8 kW, which corresponds to a density of 3.2 kW / m2. The maximum power of all power receiving devices of the data center is 29.9 MW. In order to improve the reliability of power supply, the facility has two power supply systems: main and standby. Dynamic rotary uninterruptible power supplies (DRUPS), production by Holland company Hitec Power Protection, are used as sources for the system of uninterrupted guaranteed power supply. The generator is powered by ?ummins diesel engines. This DRUPS has a capacity of 1880 kW in continuous load mode. One of the main tasks that designers and builders at the site had to solve was the removal of exhaust gases from powerful diesel engines. The parameters of the installation require a temperature stability of 450°C and a gas-tightness of up to 5000 Pa. 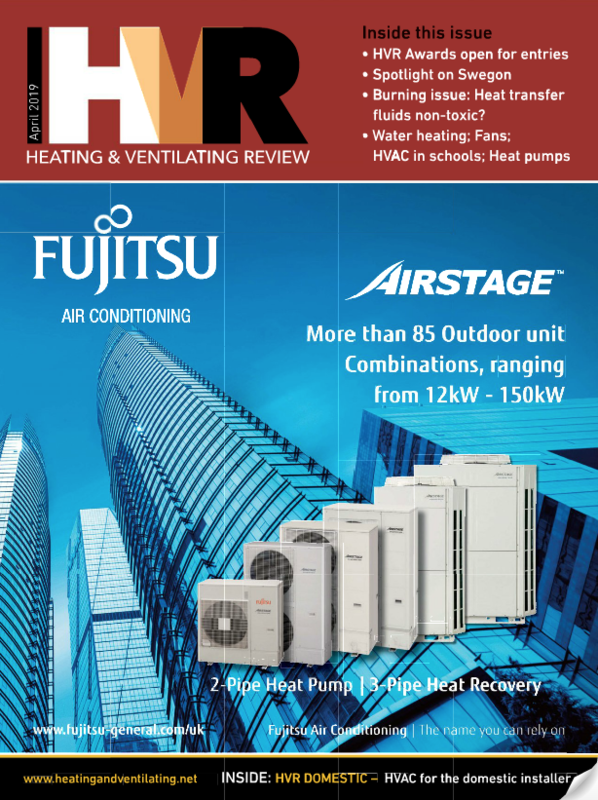 When choosing a modular flue system, the most important condition was the gas tightness of the module connections, ensuring the indicated quality for the entire lifetime of the chimneys. This requirement became one of the most important according about 20 m of each flue length passes inside the building through the premises where personnel and expensive equipment. Place chimneys on the facade of the center’s date did not allow the specificity of the architectural and planning solutions of the object. 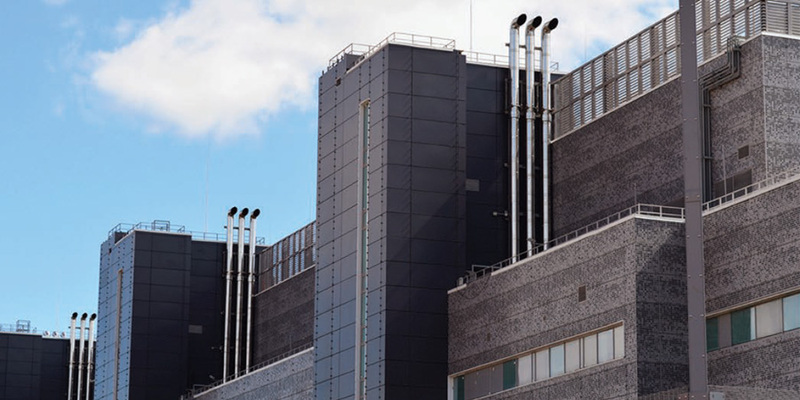 Accordingly, an important factor in choosing a modular flue system was static strength, because the height of the chimney at the facility is 32 m and the system is subject to severe wind loads. 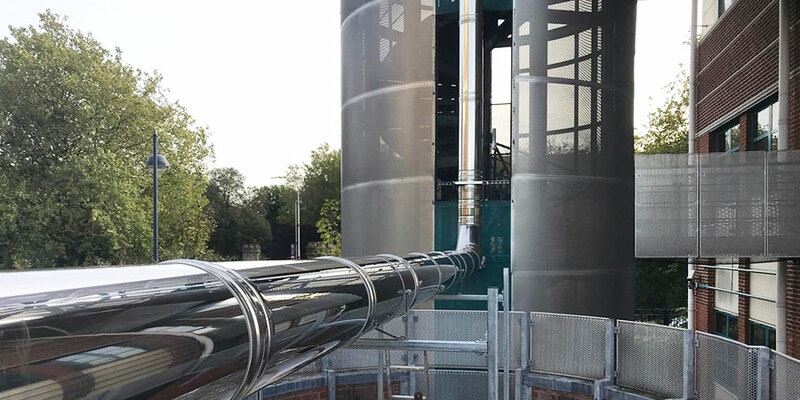 When a customer was choosing a chimney system, various solutions of domestic and foreign companies were considered, but only Schiedel’s HP5000 chimney system satisfied all the requirements. *Comments: this delivery parameter is only for 4 models. In June-July 2018, delivery and installation for 5 modules is planned. Sberbank Data Centre was created by theLondon Architectural Bureau Zaha Hadid Architects. It was founded by British architect Zaha Hadid in 1979. She is the first woman to become the winner of the most prestigious award of the world architectural community – the Pritzker Prize. The architect died at the age of 65 on March 31, 2016 and she was one of the three most influential architects on the planet. Among her works are the National Museum of Arts of the XXI century in Rome, the Water Sports Center in London, the Heydar Aliyev Center in Baku, the Rosenthal Center for Contemporary Art in Cincinnati and the Guangzhou Opera House. For more information, don’t hesitate to contact us today for any help and advice if you have a Commercial Project. It’s just not homes and commercial premises that our flues are used for, but also hotels, hospitality and catering. One such project was at Chewton Glen, where we installed a substantial Pizza Oven, using the HP 5000 system. Historically, the first recorded mention of ‘Chewton Glen House’ was around 1732. HP 5000 is a bit younger than that, being a technologically advanced twin wall flue manufactured with a 316-grade stainless steel liner and 304-grade stainless steel case. It is insulated with a 25mm/50mm thick high-density superwool blanket and is designed to operate under pressure up to 5000Pa (European Standard Designation H1). Operating with a continuous flue gas temperature up to 600 degrees, which is the European Standard Designation. The system is tested for thermal shock at 1000 degrees. 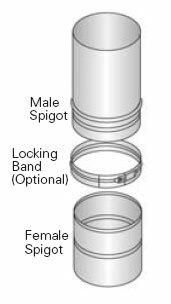 The components are flanged at both ends with a 25mm prudruding spigot at the male end to ensure correct alignment of joint and seating of the pre-installed gasket (no sealant required) on the engineered flanges. The joint of the two components butted together is secured using a V band then wrapped with insulation and a cover band. 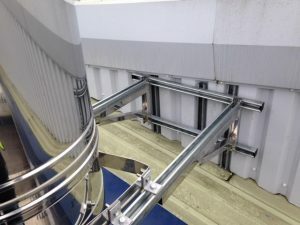 The task was to supply, deliver and install a 200mm ID flue off a Woodstone Pizza oven rising vertically for approximately 1.5m through the roof and then 45° across to avoid an air handling unit. The flue again turns 45° and rises vertically for approximately 2m to termination. A very accomplished task, and more important as it forms part of “The Kitchen”, a cookery school which provides an informal dining experience offering you the chance to watch the expert Chefs at work, including the renowned James Martin, amongst others. 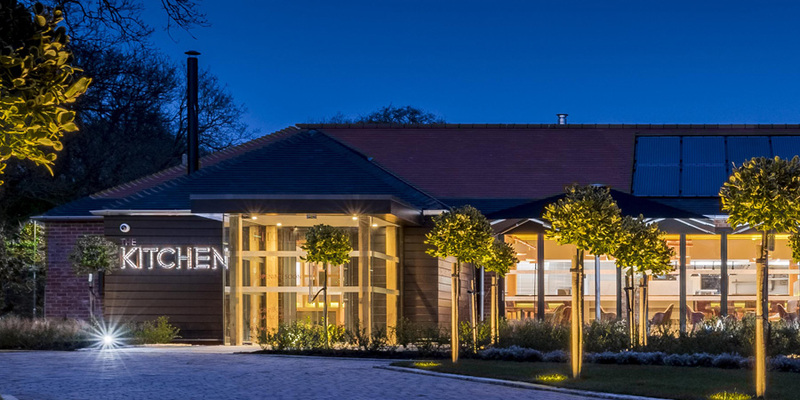 The à la carte menu features gourmet burgers, superfood salads and much more, as well as wood-fired pizzas (obviously) – and we can confirm that the installers tested it with one of Chewton Glen’s tasty pizzas ?? For more information on this project and others, please don’t hesitate to contact us. 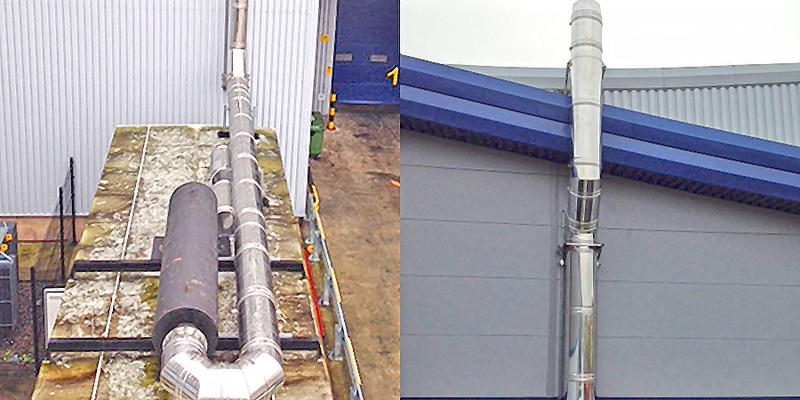 FLUE FOR A DISTRIBUTION CENTRE IN AMESBURY. Highly efficient ICS 5000 installation. Schiedel undertook the installation of a generator exhaust system with Dieselec Thistle for TJ Morris (who trade as Home Bargains), in Amesbury, just a stones throw from Stonehenge ?? The ICS 5000 system was used and from the generator silencer flange, the Ø500mm flue turned through 180° to then ran horizontally approx. 9m to connect to a 135° tee. The flue then rose vertically for approx. 11m to termination with the offset around the building overhang. At the base of the system was a 135° Tee, below which was positioned a support plate assembly with tee cap and a drain connection. The system terminated above the roof and was finished with a tapered terminal. All systems were horizontally supported by means of ceiling hangers and vertically by means of adjustable wall brackets and support plates. ICS 5000 is a twin wall flue manufactured with a stainless steel liner and stainless steel case. It is insulated with a 25mm thick high-density superwool blanket and is designed to accommodate pressures up to 5000pa. This project, involving both Prima Plus and ICS Plus, was for Thorpe Academy, a secondary school in Ryton, Tyne & Wear. The school is actually named after Charles Thorp who was a rector of the parish of Ryton and, in subsequent years, became the Archdeacon of Durham and the first warden of the University of Durham. The project we undertook for them was with a mix of ICS and Prima Plus. 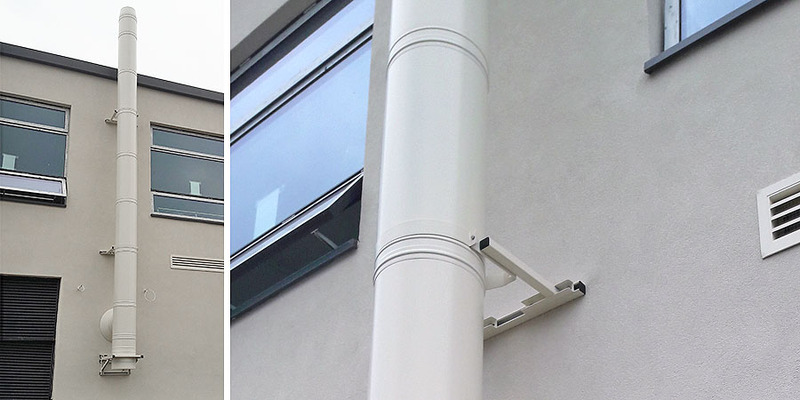 The interesting aspect of this project was the additional request of making sure the flue was finished in “Oyster White”, to match the existing building. Prima Plus is a single wall flue manufactured from high corrosion resistant stainless steel grade 316. With the addition of a silicone gasket fitted to the bead of the male spigot, it is designed for use with a new generation of condensing gas and oil appliances typically with continuous operation temperatures of up to 200°C and positive pressure up to 200 Pa at the appliance outlet. Condensing flues systems tend to be subject to significant corrosion attack by condensation and flue gases. However, Prima Plus is specifically designed to resist corrosion for the longest possible flue life. It is the only stainless steel single wall flue system in the world to have passed the internationally recognised GASTEC corrosion test. …and additional Remeha Boiler installed. Arthur Dann Court, in Portsmouth, built in 1988, provides accommodation with support when needed. The residents are able to live as independently as possible in their own homes. With 49 flats, the building is home to a number of people and, as expected, regular social activities take place in a safe and secure environment. 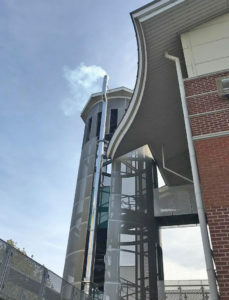 Schiedel used the 100mm ID Prima Plus system connecting into a 200mm ID Prima Plus header which then connects into the existing flue. 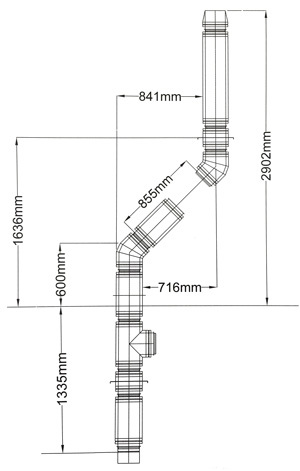 Prima Plus is regularly used in Commercial applications as it is a high quality 316L stainless steel single wall flue system with a wall thickness of 0.6mm. It is designed for use on gas and oil burning stoves and boilers with continuous operating temperatures up to 450°C and short firing up to 600°C. With the addition of a gasket to the joint, Prima Plus is designed for fluing condensing gas and oil appliances with positive pressures up to 200Pa, continuous operating temperatures up to 160°C and short firing up to 200°C. Again it shows how efficient Schiedel are in completing various projects. For more details on our products and services, please browse the website, take a look at our social channels, or contact us via email or call 0191 4161150. A recent project was completed with Dale Power Solutions, which also involved using a 38 metre length truck mounted MEWP to stretch to the work area. 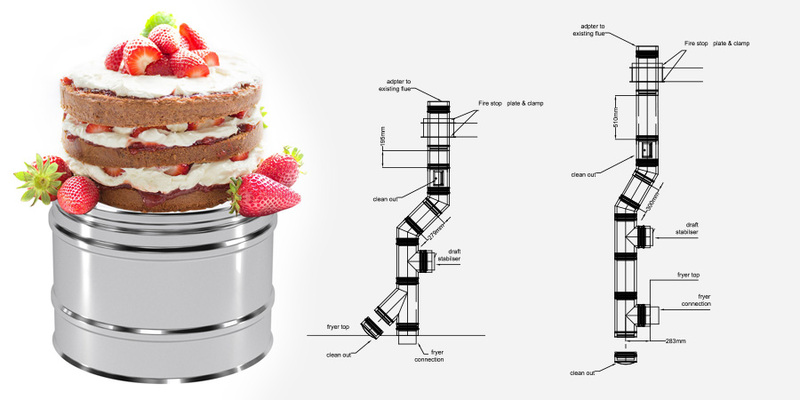 ICS 5000 is a twin wall flue manufactured with a stainless steel liner and stainless steel case. It is insulated with a 25mm thick high-density super wool blanket and is designed to accommodate pressures up to 5000pa. A Uni-strut framework was installed on the fire escape steel around the stair case. This was to support the exhaust flue riser. The framework clamped to the steel work, and cantilever arms passed through at the opens sections of the surround. These open sections were covered in bird mesh. The flue terminated in an OPEN terminal, approximately 1- 2m above the roof of the fire escape staircase. Click here to find out more about: Schiedel Chimney Systems Ltd.